Google+ Plus has dedicated photos section powered by Picasa Web service. You can upload lot of images and neatly organize them in different photo albums. Now you can add more photos to your Google+ Plus profile without need of manual photo uploading. 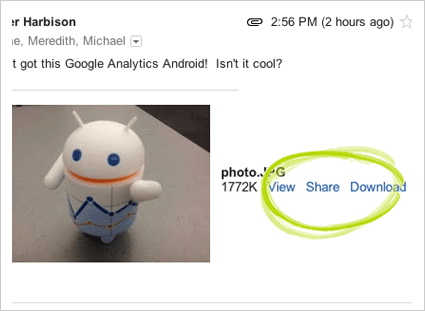 For example: photos received as attachment in your Gmail account can be directly sent to Google+ Plus photo album. Till now, one would download photos received along with email in Gmail account. Then upload those photos manually to Google+ Plus album to allow sharing with friends in Google+ circles. New feature removes the manual photo downloading and re-uploading routine and allow direct photo transfer from Gmail to Google Plus albums. 1. Open email message with attachment photos in your Gmail account. At the bottom of message you should see photos attached to that email message. After the automatic transfer and uploading, photos will be viewable only to the circles that you choose to share with on Google+ Plus. For sure a quick and easy way to beef up your photo albums on Google+ Plus via images received with email messages on Gmail. This idea is useful, normally we see the options but ignore. So we download and post them by downloading and again uploading. However this is helpful.